The eye of the Internet makes one aware that Internet not only knows everything, but is also sees everything, courtesy of the many Webcams at the space. 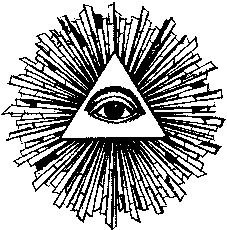 The eye communicates with you by changing its color. When nobody is watching, it is green. When someone (or something) starts watching webcam 1, the eye turns to blue, then yellow, orange and red. When more than 5 streams are active, the eye turns white. 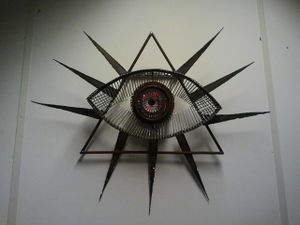 Eye with the rays, mounting bracket, ready to mount the electronics. Getting a sense of how the color works with the steel, testing the led cables. Breadboard of the working prototype. We later connected all the leds behind single resistors per color channel. Cleaned, and mounted in a triangle. Triangle cost a surprising amount of effort, especially starting from bent junk rebar. The final study before welding. The back of the iris. I should have grinded the zinc coating first. It became really messy and required a lot of electrodes. After welding bunch of nails to each other, and burning them in the process, a I decided that I really needed a frame to carry the eye edge. een trigger krijgen per request (1 per stream-begin) van de server, de streams hebben een TTL, dus dat is ook voldoende qua quesstimate. De rate, per seconden via een colormap. als je het helemaal fancy wil laat je eventueel wat geluiden via het space sound systeem lopen. Note that SSS start versterkers on demand op, en dat duurt even. een (gemotoriseerd) ooglid voor privacy control. een kwadrant/slice van t oog kan verlichten, gebaseerd op richting van de obstakel/ persoon die dichtbij staat. de volgende versie heeft oogleden/wimpers van gasvlammen. / Teslaspoelen die vlambogen produceren! This page was last modified on 27 October 2016, at 22:08.